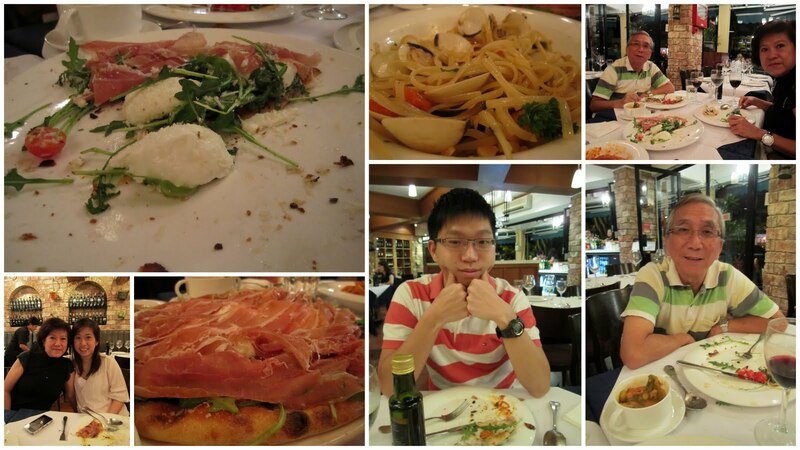 Brought family out for italian dinner today @ Donna Carmela, Greenwood. Was there few months back with tyre and loved the food! The most memorable dish was the signature pizza that had generous topping of rocket salad, parma ham and mozerella cheese. Yumz! Its pretty pricey and had been thinking of going back to 'relive' the good food. So, the best way to enjoy good food would be to have it with love ones so decided to bring family there to enjoy good food. But this time, it was way below expectations - what a let down. The service was lukewarm (they only focus on the ang mohs), the food was lukewarm when it reached our table. The minestrone soup resembled more like a stew rather than a soup as it was probably 4/5 filled with vege and stuffs and little liquid. The pasta tasted a bit uncooked and not hot enough. The Vongole was so oily, even oilier than the alio olio pasta. The signature pizza was the worst - i had been drooling over it for ages and was thorougly dissappointed. The pizza was BURNT/CHARREd. Very very obviously overcook and burnt and yet they served it to ask. And when i told the waiter about it, he just took it back and replaced with a new one, without any explaination! Was pretty pissed with the whole experience. Seperately, dropped by Ms G's fair and snapped pictures of my stuffs @ her fair :D . Spot my signature metal clasp purses on the first shelf. oooo let's go one of these days for dinner!